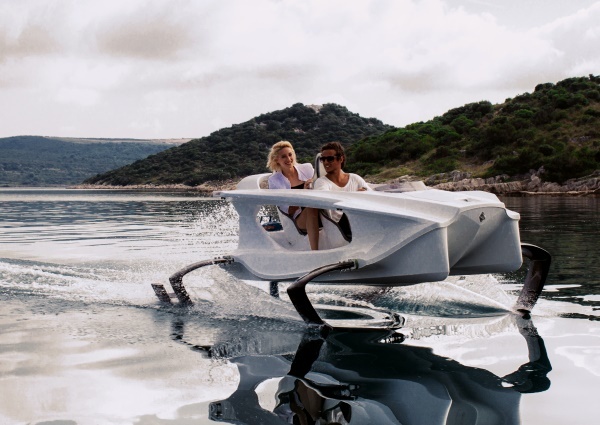 A thrilling new two-person electric powered personal watercraft, the Quadrofoil, flies above the waves with unique hydro foiling technology. The Quadrofoil is a vessel built in Slovenia by skilled engineers, nautical enthusiasts and visionaries with a passion for excitement and ecology. The goal was to design and manufacture the world’s first electric and environmentally friendly hydro foiling watercraft for personal use. What resulted was a sleek seafaring coup perfect for anyone ready to literally fly over the water. The Quadrofoil skims over lakes, rivers, seas, and even eco-zones where regular motor boats can’t go. Looking like the water-version of a sci-fi starship, the Quadrofoil is made for speed and power. Aerodynamic styling and precision engineering means the Quadrofoil’s hollow hull slices the surface of the water while its owners rest on soft, ergonomic seats designed for complete comfort. The vessel hits an impressive 21 knots an hour at top speed and boasts a range of 54 nautical miles on a single charge. Best of all, nothing interrupts the experience because the Quadrofoil operates with no noise. As much as the design team wanted to create a one-of-a-kind experience, they were focused on keeping the vessel eco-friendly and safe. The Quadrofoil produces no waves and no emissions, allowing it to go in marine protected waters unreachable by other vessels. Rigorous testing was done on the watercraft to make sure it ran at optimum efficiency and stability. The inbuilt anti-collision system was designed to absorbs the collision forces and reduce impact for increased passenger safety. The hull is hollow and engineered with fiberglass, ensuring it will stay afloat in even the worst circumstances. The company claims the Quadrofoil is “unsinkable.” Just in case, two life jackets, a paddle, and a safety whistle come standard with every Quadrofoil. Operating the watercraft is simple. It’s engineered with a touch screen that notes battery power, range, speed and consumption. The touch screen attaches to the steering wheel to serve as a detachable key that must be present to start the engine. This patented, integrated steering system helps stabilize the vessel, making it super responsive and drift-resistant on the water. C-foil technology is used to lift the boat above the surface of the water. The hull is lightweight and modular to make handling the vessel easy enough for a single person. A limited run of 100 Quadrofoils is set to ship in March of 2016. Preorders are being taken now on www.quadrofoil.com for the cool price of $28,000 each. Tagged Big Boys' Toys, LifeSpice, Luxurious lifestyles. Bookmark the permalink.